The Honor 6X was launched on 24th January, 2017. The phone has a 5.5-inch IPS LCD Full HD (1,080 x 1,920 pixels) display and a pixel density of 401 ppi. The smartphone makes use of an octa core HiSilicon Kirin 655 that is coupled with Mali-T830MP2 GPU, and comes in variants of 3/4GB RAM and 32/64GB default memory capacity. This storage can be expanded up to another 256GB with the help of a microSD card. As far as the camera is concerned, the 6X sports dual cameras (12MP + 2MP) at the back via which one can also record FHD videos. For selfie admirers, there is an 8MP front snapper which captures good quality images. The connectivity aspects on board include wifi 802.11 b/g/n, hotspot, v4.1, A2DP, EDR, LE, microUSB v2.0, with A-GPS, GLONASS and dual sim (Nano+Nano). It is fuelled by a 3,340mAh li-polymer battery with fast charging support. The smartphone runs Android 6.0(Marshmallow), out of the box. Sensors on the phone include compass magnetometer, proximity sensor, accelerometer, ambient light sensor and gyroscope. The handset is available in Gold, Silver, Grey, Blue and Rose Gold colors in the market. The Honor 6X is priced at Rs. 11,999 for 3/4GB and 32/64GB variants. Amazon is offering discount up to Rs 4,000 on Honor 8 Pro and Honor 6X smartphones as a part of the limited period offer. Amazon, Flipkart and Honor's own website are now holding the "Honor Gala" sales on their platforms, which will go on until November 11. 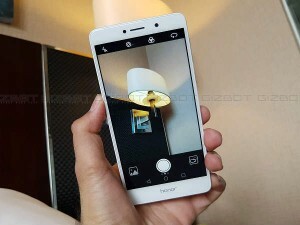 Honor has just announced exclusive offers for its bestseller devices the Honor 8 Pro and Honor 6X, on leading e-commerce platforms. Honor 6X and Honor 8 Pro are now listed on Flipkart during the Big Billion Days sale with attractive discounts.